Philosopher's Path does sound poetically ancient, don't you think? In reality, it is one of the newer attractions of northeastern Kyoto, built as recently as during the Meiji era (everything is relative, of course, as even this is now way over 100 years back). 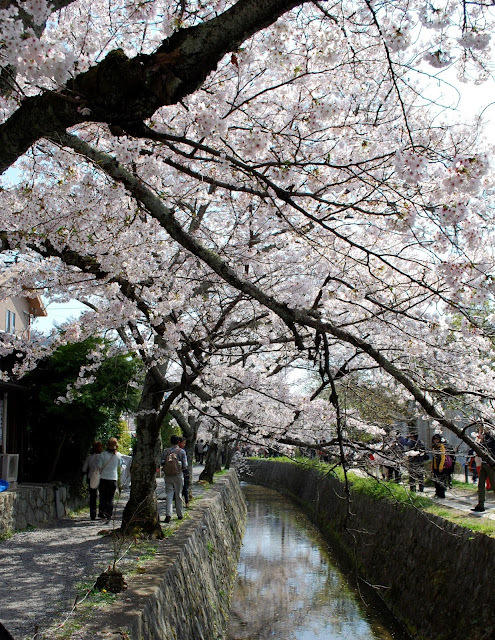 And instead of some venerable Zen philosopher, it is named after Professor Nishido Kitaro, an influential 20th century philosopher, who used to do his daily meditation by walking this charming stone-paved stretch that follows a narrow water canal and is lined by hundreds of cherry trees. Philosopher's Path gets very busy during the hanami season, with thousands tourists - most of them Japanese - wandering through the three kilometer walk. All of them admire the sakura blossoms, searching for the most handsome blooms to catch on their cameras and the best places for the mandatory poses for their family albums. Small cafés cater for the crowds, offering drinks from green tea to sake and Asahi beer, and anything in between. The walk passes several temples and shrines like the Ginkaku-ji, Honen-in, Otoyo Shrine and Eikan-do Zenrin-ji, making it a perfect destination for a whole day of discoveries. 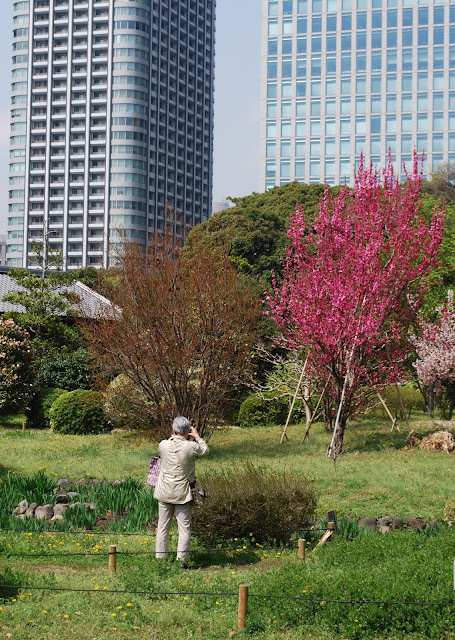 In our case, despite the amazing blooms, adding even one small temple would have been stretching my girl's limits on that hot and sunny afternoon, so we just settled for an aptly-flavored pink sakura ice cream, sitting the shade of the cherries and watching the crowds go past. Our own perfect little hanami-party, we thought. Shu Sui Tei was built about 200 years ago as a tea ceremony room for the aristocratic Kujo family. The large residence building that originally accompanied this little house was pulled down during the Meiji era, only this and the garden with its pond were left intact, and are still part of the Kyoto Goen imperial park. The wisteria trellis over the pond was full of buds, and must look spectacular when in bloom - I would love to sit in a little rowing boat under it with a glass of wine in hand! And old stone basin with a bamboo dipper for washing hands. Shu Sui Tei was one of those unexpected lovelies during our trip to Kyoto. We had just come out from the Kyoto Imperial Palace, which opens for the public five days during spring and autumn (more of it in a later post). Strolling through Kyoto Goen, the large park outside, we got a glimpse of this wonderful little tea ceremony house by a small pond in the southwestern corner of the park, and of course, ventured in to see more. After the crowds at the handsome Palace, the small house was a respite of calm. There were almost no other visitors, only an old Japanese couple sitting and contemplating the view in silence. We washed our hands from the old stone basin and did the same, and stayed for a long while. View from the second floor towards the pond and the park; a stone bridge leads cross the pond. Irregular stone slabs lead to the entrance, and out again, after a refreshing pause at the Shu Sei Tei. Kiyomizu-dera on the blooming hills of Kyoto - if you look closely, you can see the incense floating up from the burners on the huge wooden platform in front of the temple. I had this clear memory from a previous visit to Kyoto in 1998: huge wooden poles holding up a platform, soft veils of incense from brass burners curling up to the crisp spring air, a sound of rippling water echoing from the hills covered with Japanese maples just opening their leaf buds. Somehow, this memory has no crowds in it, just crisp, clean air, a bit of incense, and the sound of water. And still, the crowds must have been there. 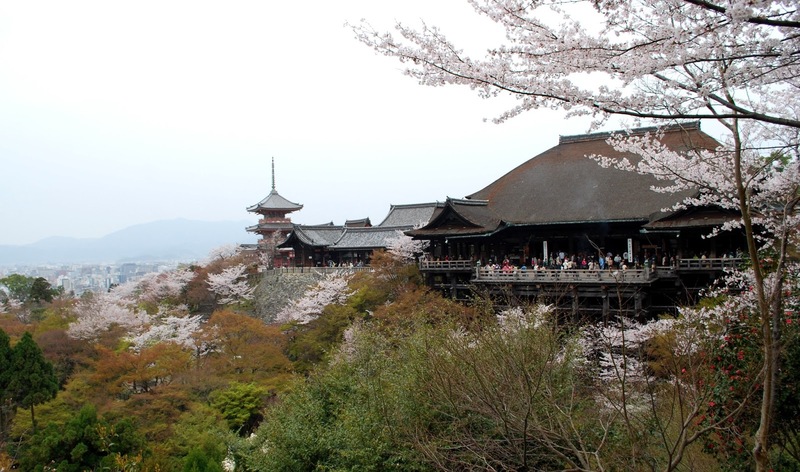 Kiyomizu-dera, the place of my memory fragment, has been visited by pilgrims and tourists for centuries, founded as it was in year 798 as a major Buddhist temple. I'm not sure... do I imagine it, or is it really so much busier now than just 15 years ago? A UNESCO World Heritage Site since 1994, Kiyomizu-dera is impressing, but the crowds attracted by the nomination take its toll on the experience. Guilty as I am after several recent visits to these cultural "superstar sites", I've silently started to think that one should never nominate anything one loves - the inescapable troops arriving afterwards will almost certainly kill much of the original atmosphere. Of course, I enjoyed seeing this majestic (I know I overuse the word...) temple again. But for a still and quiet atmosphere, it is better to visit one of the many nameless (only for us tourists) small temples found midst almost all ordinary neighborhoods. Clap your hands twice, bow twice, clap you hands twice again. And listen. View towards the three-storied Koyasu Pagoda - visiting it is said to bring about an easy and safe childbirth. But look at the cherries! One of the 13 meter high wooden pillars holding up the platform in front of the main temple. All of this was built without any nails, just by joining the timber together... The present buildings are from 1633, and still holding strong. Cherries and magnolias mingling on the hills by the temple. I hope I get this right... but these little stone sculptures are called Jizō, and they are little Buddhist deities supposed to alleviate the suffering of the living and the dead. They are worshipped and decked with clothing, toys and other objects in hope for divine intervention in the lives of those who still are here on earth, or those who have already entered the feared halls of hell. It is lovely to see how Japanese women and men wear their traditional clothing when visiting the temples. The week we visited was the busiest sakura-gazing week in Japan, and thousands had travelled to Kyoto to see them blossoming. We had just as much fun admiring their beautiful garments as the cherry blossoms. Travelers at the Otowa waterfall at the base of the main temple - Kiyomizu-dera means literally "pure water temple", and the waters are believed to have strong powers. Here, the waters divide into three separate streams, and visitors use cups on long poles to drink from them. Each stream is said to have a different benefit: the first causes longevity, the second gives success at school, and the third gives fortunate love life. No mixed drinks here, though - drinking from all three is considered very greedy.